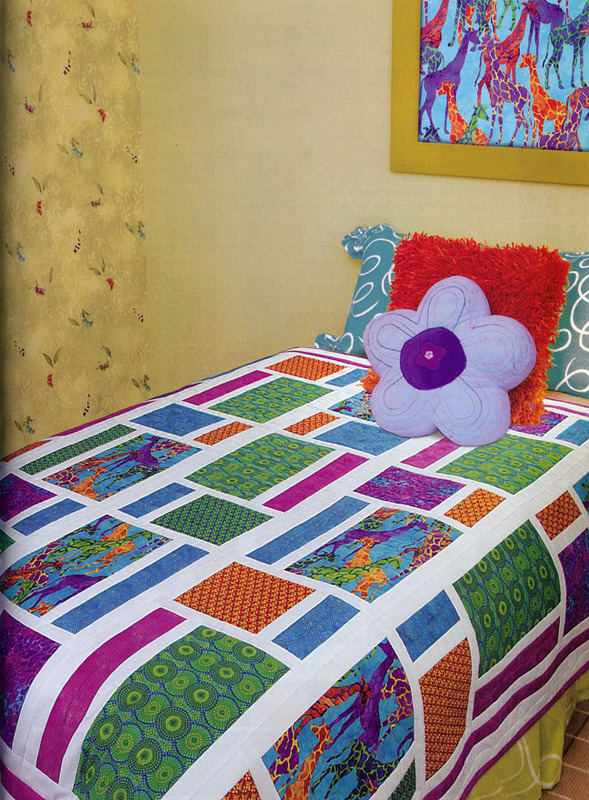 Have you seen Heidi Pridemore's latest design in the spring 2013 issue of Quilt Trends magazine? We love it and are excited to share it with you! Heidi used the bright colorway of Ro Gregg's Tribal Council line to a modern design. 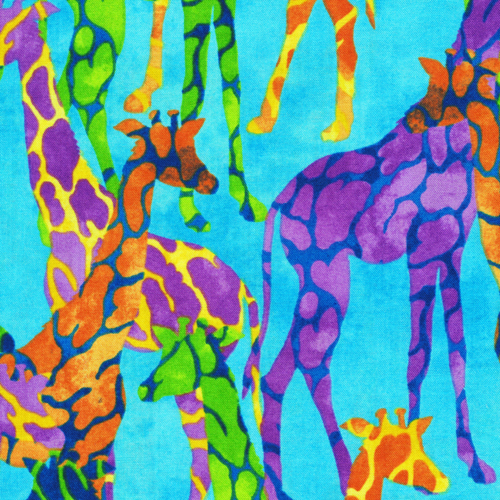 We love how she contrasted the vibrant prints (don't you love the giraffes?!) with the solid white narrow sashing so that the block components really pop. Here's the skinny on easy-to-make strip-pieced quilt, straight from Heidi. Q. How did you come up with the idea for this design? Heidi: I wanted to play with rectangles and create a clean look that was easy to make. Q. What prompted you to use white for the sashing? Heidi: For the longest time I did not like to use white in my quilts, but now I can see the value in the crisp, clean look you get when using white, especially with bright and busy prints. It is like putting a spotlight on each fabric and letting them shine. Q. What attracted you to the Tribal Council line? Heidi: The colors: it is always about the colors for me. The brighter, the better! Heidi: I really like the giraffes! They look like they are peeking out from their world into ours, It is almost like a scrapbook page with photos. Q. How did you choose to machine quilt this? Heidi: We kept the quilting very simple to accent the look of the quilt. It is all anchored with stitch in the ditch, and then there are doodle vines and leaves in the blocks for added interest. Q. What's one thing you'd like quilters to know about this design? Heidi: It is such a wonderful pattern to showcase any collection. Many times my patterns can be fabric specific, but this gem can be made with anything. Find out more about Heidi here. 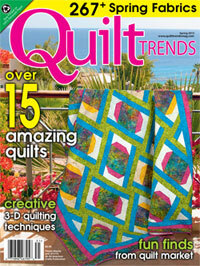 Click here to find QuiltTrends. Love your stunning fabrics and your quilt looks fabulous! !